A ranch-style home from the ’50s makes way for what’s now a conversational piece in a traditional neighborhood. What was once a property featuring a 1950s ranch-style home near Lewis Avenue and Utica Square has now assumed a modern persona, thanks to the designs of Brian L. Freese, a well-known Tulsa architect and the principal of Freese Architecture. That house was demolished to make way for a two-story home that is decidedly contemporary. It has an abundance of natural stone and stucco on the exterior to create a warm, tactile feeling. The space is an architectural conversation piece in this traditional neighborhood. The public entry into the courtyard is punctuated by a cantilevered plate steel canopy and a gate of tightly spaced wood louvers. 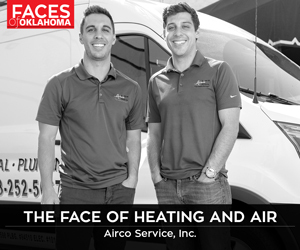 The architectural design is perfect for T.J. Trad, making his mark in Tulsa as a young cardiologist and the founder of a humanitarian organization fighting poverty around the world. Also unusual in this project is the way Freese didn’t create a conventional front door, easily visible from the street. Instead, he opened a slot in the stone mass with a gate leading into a courtyard. “From there, guests enter into the house,” Freese says. “I love courtyards. I’ve had a love affair with them since I discovered wonderful courtyards while I was attending Tulane University in New Orleans. Those courtyards introduced me to ingenious ways of capturing outdoor space and incorporating them into a home’s private spaces. The second level of the home features the crisp and masculine master bedroom and bath. A handsome staircase to the second level enhances the lower living area. Freese maximized the space underneath the stairs for cabinet storage near the kitchen. The staircase leads to the bedroom and bath on the east wing and recreation room on the west. He designed a bridge, a feature he previously used to link both sides of the upper floor, to create an overlook into the public spaces and courtyard. 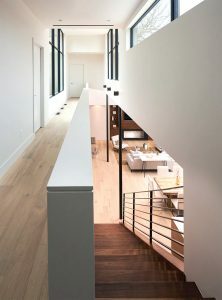 Freese, who addresses design challenges with contemporary solutions, rose to the occasion with the street-facing garage. For this home, he mitigated the visual impact of the front-facing garage by deeply recessing its doors. He also used a dark bronze color for the garage doors and walls. Large windows on the second floor provide outward views and add natural light onto the first level. “I tried to make them disappear,” says Freese, who also constructed an auto court visible from the street. Landscape architect Derek McCall added the important “first impression” touches. 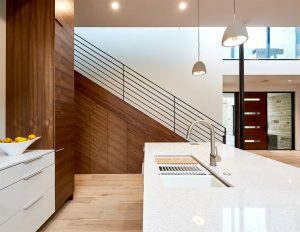 “Derek did a great job of integrating the landscape design into the house, with a careful selection of field grasses and different textures of gravel, artfully and minimally placed,” Freese says. 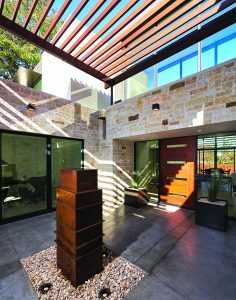 Freese used exterior materials of Oklahoma-sourced stone, plate steel and solid timber around the home, especially the back patio.